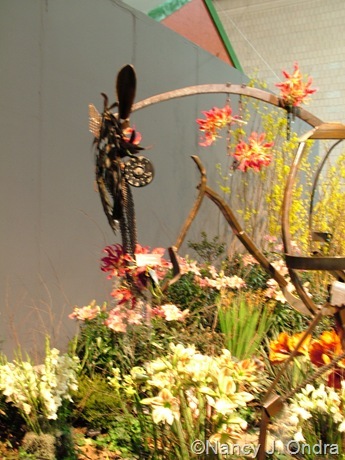 My memories of past shows include a whole lot more color and fragrance (you know how powerful paperwhites and hyacinths can be in enclosed spaces), and many more exhibits in general. As always, I admired the amount of work and dedication it took to put each exhibit together. Overall, though, I was surprised at how much more emphasis there seemed to be on the retail side. Well, I guess I shouldn’t have been surprised: I completely understand the lure of acquiring more garden stuff. (If this horse sculpture had been for sale, oh yes, it would have been mine!) And the retail side certainly appeared to be more welcoming; for some reason, the area with the exhibits seemed rather gloomy, with uneven lighting, while the retail area was far more bright and cheerful. I’m not used to taking photos indoors, so it didn’t occur to me to think about using my flash (and a lot more patience) when trying to photograph some of the exhibits. Unfortunately, most of the few pictures I took didn’t turn out well. I do want to show you what I considered the gem of the show: A stunning variegated version of southern bush honeysuckle (Diervilla sessilifolia) that’ll apparently be released in a year or two under the trademark name Cool Splash. The straight species has been a dependable performer for me, thriving pretty much in any place I put it (wet, dryish, full sun, morning sun only, baking afternoon sun: you name it). Even when voles ate most of the roots of this clump, the stem bases of this gently suckering deciduous shrub rerooted themselves and survived. 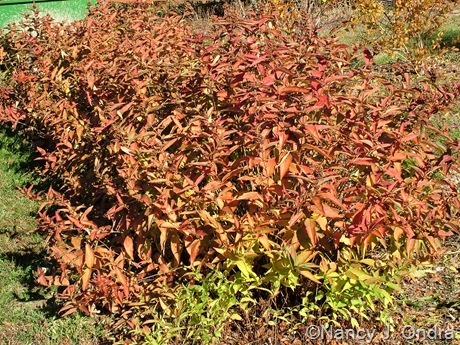 The species grows about 3 feet tall here, with bright yellow blooms well balanced with clean, bright green foliage through most of the summer, plus red fall color late in autumn. I can find very little information about Cool Splash right now, so I have no idea if it will differ much in the essential traits. 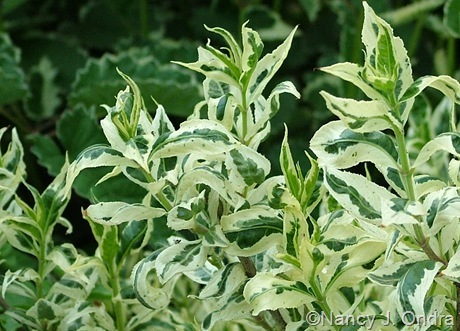 But with its dramatically white-splashed leaf edges, I wouldn’t care if it never flowered or turned color in fall. This is definitely a plant I’ll be looking for in nursery catalogs next year. 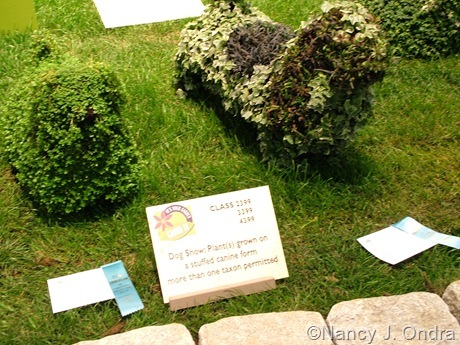 The other highlight for me was one of the horticultural classes: Dog Show. 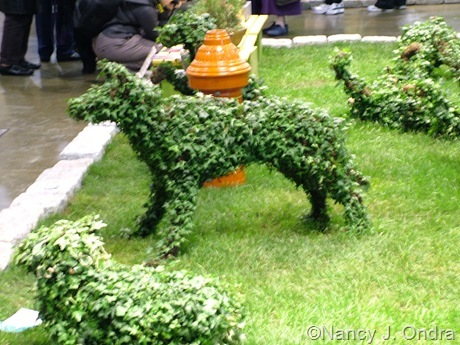 The life-sized dog topiary forms were staged on a grassy area, complete with fire hydrant. I was a little disappointed that they didn’t have a Sheltie, but despite that lack, the collection was very cute and fun to see. Here, at least, the lighting was quite good; my focus, however, was not. Still, I hope you can get the general idea. I’m thinking I’d really like to do one of these for my garden. Or…hmmm…I wonder if anyone makes alpaca topiary forms? Go for it, Nan! Alpaca topiaries!!! I’m thinking it would be hard to keep the long, skinny neck part watered, though. I may have to reconsider this! Nan, thanks for the honest review of the Philly show. I agree, alpaca topiary, maybe not a lifesize scale, would be an apt addition for your garden. It could be your photo ID. We went to that show one year, 1983, I think, when we lived in Berwick, PA. We had all four kids with us, a family vacation, ages 8,6,4,and 2. It affected the amount of garden viewing that could be done, and I have always wanted to return sans offspring, although they are gardeners themselves now and would probably love it. Frances, if you’ve mentioned it before, somehow I missed the fact that you used to live up here! I can’t imagine what it would be like to shepherd little ones through those crowds. I’d always heard that it was better to go in the evening, and that certainly seemed to be the case. We got there around 4:30, and while there were still lots of people, it wasn’t too overwhelming – at least around the exhibits. The shopping area was definitely packed, though! 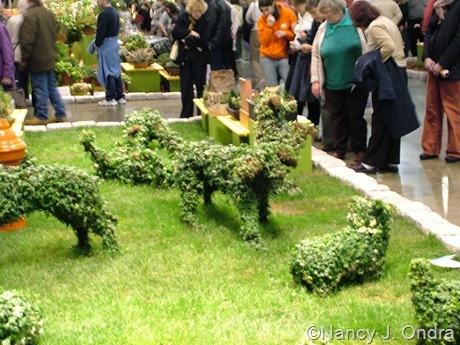 Did they have a Borzoi topiary? Last year I came across a book that had instructions for DIY topiaries, but, of course, I can’t recall the title. I have a half-finished metal mess waiting for me as a result of reading that book. As for the alpaca neck, you could grow a mini ivy on the head & trail the vines down over the neck part, so you wouldn’t have to water the neck. I didn’t see one, MMD, and I think I’d have noticed one that size! Most of them were rather small dogs. It would have been fun to see more colored foliage used. Can you imagine a chocolate lab done in ‘Persian Chocolate’ lysimachia? Or a golden retriever done in golden creeping Jenny? For the alpacas, I’m thinking some small creeping grass or sedge could be appropriate to create the shaggy effect. (Then it could even be sheared once a year!) Maybe I could find instructions for a giraffe form and modify it…. A llama would look great. I just chuckled reading MMD’s comment about not having to water the neck. You could use wooly thyme too. Would that work or is it only certain plants that are used? I wanted to congratulate you on your award. That is wonderful news!! Your book looks beautiful – I read about your award at Cold Climate Gardening. Super idea, Kate: woolly thyme would be perfectly appropriate for an alpaca/llama topiary. And thanks for your kind comments about Foliage.